“The discovery of anthocyanin expression in maturing sweet corn was, as the saying goes, “completely off the chart.” The ear shown in Fig. 1, was removed from a plant in the downed area of the crop formation. 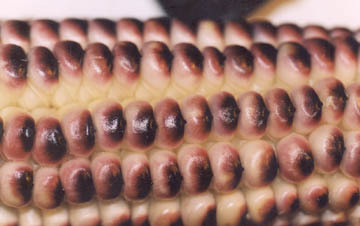 Figure 1 – Detail of sweet corn kernels showing anomalous pigmentation (anthocyanin). Ear taken from inside the Hillsboro, Ohio, crop formation (Lab. Code KS-06-46). 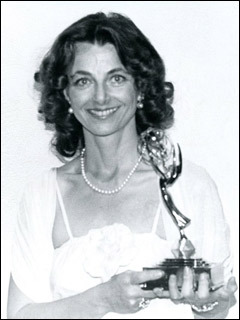 Photograph © 2004 by W. C. Levengood. Each kernel appears to have a purple “skull cap” with a tiny peak at the top. This coloration was located at the endosperm end of the seeds. The kernels on a normal, upright plant (control) in Fig. 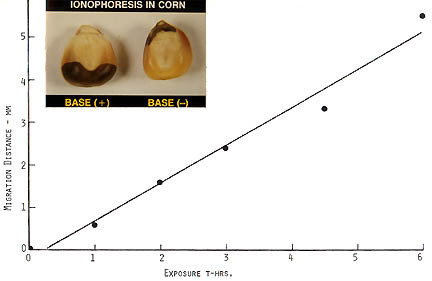 2, help illustrate the striking difference between normal kernels and the pigmentation anomaly. 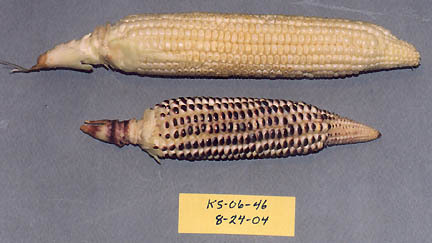 Figure 2 – Kernels on a normal ear (control sample) taken outside the Hillsboro crop formation. Compare with the kernels shown in Fig. 1. 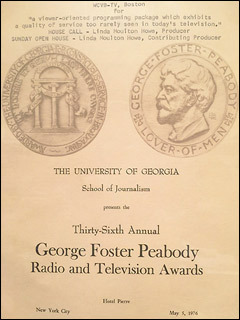 Photograph © 2004 by W. D. Levengood. The interact ears in Fig. 2 were photographed to demonstrate how efficiently and uniformly the plasma energy was delivered to the plants. Figure 3 – Control ear above and formation ear below. 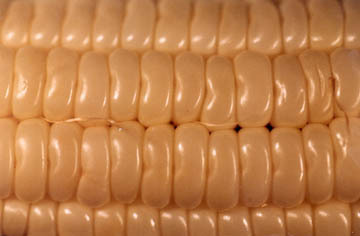 Note that most all of the kernels on the formation ear have the pigmentation. 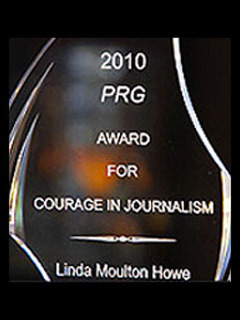 Photograph © 2004 by W. C. Levengood. Circumferentially, every kernel on the lower ear has the pigment at the endosperm end, whereas no trace of this pigment was found in the control ears taken outside the formation. Also, there did not appear to be any directional effect, that is, the ears were uniformly pigmented on all sides. However, there were ears, as shown in Fig. 4 that received much reduced levels of energy application. 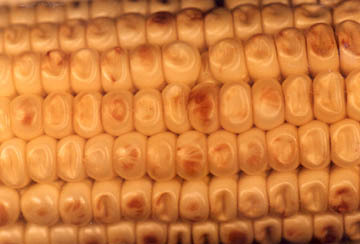 Figure 4 – This ear taken from the formation has a lesser degree of pigmentation, but disclosed indentations at the top of the kernels. Photograph © 2004 by W. C. Levengood. Although only a faint trace of pigment appears at the top of some of the seeds in Fig. 4, it is important to note that most all kernels have a pronounced indentation, an effect which is not observed in the Fig. 2 control seeds. From previous observations, it becomes quite apparent that this seed indentation is related to transient, internal heating. 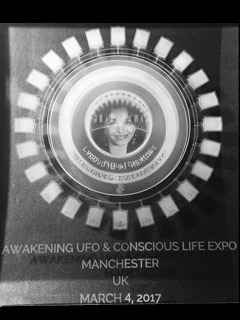 It is very likely that the source of this energy was in the microwave region. This rapid, internal build up of heat causes moisture loss from the endosperm tissues within the seed. Internal shrinkage occurs and the testa or outer seed coat collapsed inward, thus forming the indented region. This microwave heat shrinkage is quite apparent when comparing Fig. 2, showing the tight, compacted kernels formed under normal growth conditions, with Fig 1 and Fig 4 where one observes considerable space between the kernel rows. To even begin to understand the pigmentation effects on corn kernels, it is necessary to consider the role of anthocyanin in plants. These flavonoid type molecules protect the plant against photo inhibition or the impairment of certain biochemical pathways in normal photosynthesis. This impairment can occur if light levels become too high. In leaves, anthocyanin is located in a very thin layer just under the outer epidermal cells. This same characteristic was observed in the kernels taken from the Fig. 1 ear. Here also, the pigment layer was very thin and positioned just below the testa. Hillsboro, Ohio Sweet Corn Kernels? Now, we arrive at the very interesting problems of determining the how and why the anthocyanin formed on the kernels of sweet corn. As stated above, one very important function of anthocyanin is to protect the internal, photosynthetic “food factory” from injury due to pulses of high light intensity, particularly light with wavelengths in the visible region. The real enigma here is explaining the presence of this red pigment on kernels of corn, which are located under several layers of glumes (common name – “husks”). This protective layer does not allow visible light to penetrate down to the developing, embryonic seeds. Even ordinary microwave frequencies used in commercial kitchen units is of a very low efficiency and would not penetrate the layers of glumes. If however, the energy producing this skull cap effect on the kernels was at a very specific wavelength in the microwave region and was tuned to critical frequencies and wave forms involved in anthocyanin formation, the anomaly could be accounted for. As it turns out, there is additional supporting evidence that indicates this is precisely what is taking place. To help understand this complex situation, reference is made to Fig. 5, an ear taken from a downed plant in the formation. Figure 5 – Ear from formation. Shows red pigmentation on outer glume (“husk”) exposed to the plasma energy complex. The non-pigmented regions on either side are where the outer, overlapping glumes were removed just before photographing. This shows that the energies only interacted with the outer glumes. Photograph © 2004 by W. C. Levengood. The central region of the glume exhibits the red pigmentation in the ovoid shaped area, whereas a strip on each side is free of color. This is due to the fact that just before taking the photograph, the red-pigmented glumes on the right and left sides were removed, thus exposing the non-red areas underneath. With the presence of pigment on the outer surface of the ear, one would certainly expect to find the purple caps on the seeds. As it turned out, when all the glumes were removed, this ear had normal appearing seeds. By way of comparison, the glumes surrounding the ear shown in Fig. 1 and Fig. 3, were of normal appearance. They had no purple pigmentation. This clearly suggests that within the highly complex energy profile associated with this crop formation, there was one microwave component which was in resonance with the molecular structure of the developing seeds and another component of different frequency profile was in resonance with the outer leaves (glumes) and plant stem. This well defined partitioning of energy has become more and more obvious in our studies of crop formations examined in this laboratory, particularly over the last five to six years (since 1999). Before leaving this discussion of anthocyanin pigmentation, it is important to note that there is yet another energy form within a crop formation plasma complex which quite likely would have acted in a supportive manner in the anthocyanin anomaly. During research conducted at the Pinelandia Biophysical Laboratory in an investigation related to seed viability, it was discovered that during initial imbibition ( first stage of germination), an applied electric field can induce the ionophoretic transport of anthocyanin in seeds. The inset in Fig. 6 demonstrates the sharp lines of demarcation which form between the band of dark purple pigment and the normal seed tissue. Since the anthocyanin molecule has a positive charge, the migration is upward from the anode in the seed on the left and downward in the seed on the right, both seeds were exposed to a 50 V/cm electric field. The regression curve provides quantitative measure of the migration rate over a six-hour period. From the information provided in Fig. 6, it seems quite probable that a positive electric field surrounded the ears exposed to the plasma energy in the Hillsboro, Ohio, crop formation. Figure 6 – Effect of an electric field on anthocyanin transport in corn seeds. From a study conducted at the Pinelandia Biophysical Laboratory. 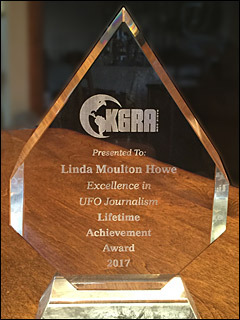 The author of this report would like to express his appreciation for the well-organized data submitted by Jeffrey Wilson and Gene Thomas. 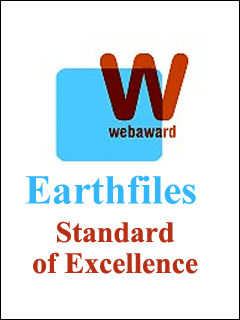 These data cover important investigative areas, which are discussed below. There were two separate sample sets of stem nodes. 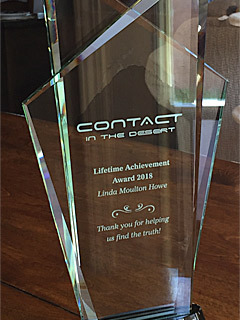 The first set was collected on July 7, 2004, or around 48 hours after the event. The second set was collected on August 14, 2004, or about a month later (after the report of a second crop downing event). Node lengths were determined with a micrometer graduated in millimeters (mm). The analyzed data from both sets are listed in Table I below. 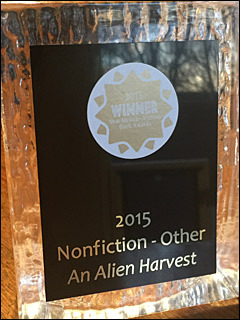 The node length increases in the crop formation samples are much higher than would be expected. The reason is the tensile strength of corn stems is in the order of 17-times the strength of wheat stems. These data again reflect the very high energy of the plasma system that producing the Hillsboro formation. As might be expected, a microscopic examination of stem nodes revealed that the inner parenchyma tissue exhibited pronounced cell expansion, relative to the controls. The upper photomicrograph in Fig. 7 shows a cross section of cells in a normal node from a control plant. 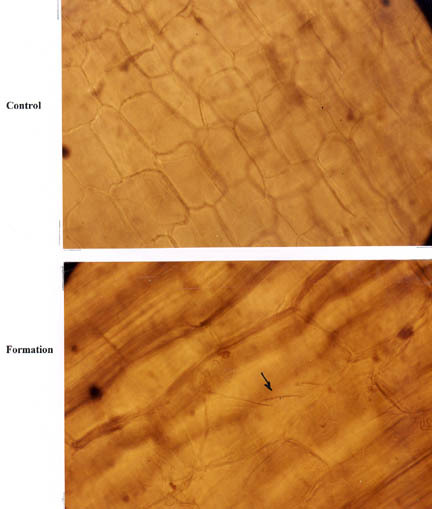 The photo below was prepared from a formation plant and the cell expansion is quite obvious when compared with the cells in the control photo. The arrow in the lower photomicrograph points to what we define as “stretch marks” in the outer cellulose matrix of the cell wall. These lines might be thought of as stress-related “slip planes” created in the cell wall as the transient microwave heating increases the internal pressure. This effect is quite often observed in micrograpphic sections prepared from wheat plants taken within crop formations – as studied in this laboratory since the early 1990s. 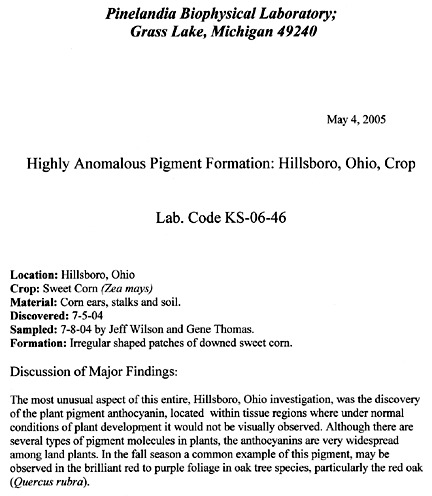 On Saturday, July 10, 2004, Jeff and Gene examined the soil for possible latent radioactivity associated with the Hillsboro, Ohio, crop formation. With a portable Geiger Counter “Gamma Scout”), they examined soil samples taken at approximately the same locations as the plant samples. By using calibrated, metal absorbers (furnished with the counter), they were able to record radiation from particles within three different energy ranges. In the first range, this instrument determines the counting rate from gamma rays (low energy x-rays). At the second level of filtering one obtains an indication of the level of gammas, plus beta particles (energetic electrons). At the lowest level of filtering, the instrument records gamma, beta and alpha (helium nuclei) particles. With each counting-filtering test series, an equal number of soil samples were taken outside the crop formation to provide information concerning the background level in normal or control soil. These counting data and associated statistical analyses are summarized in Table II, where the Geiger Counter data is given as micro-Sieverts/hour (directly related to counting rate). It was very interesting to find the radiation levels increasing (right column in Table II) as the beta and alpha particles are detected by the counter. These data suggest that the plasma energies producing the crop formation were of sufficient energy to induce radioactivity in the soil. Without a scintillation spectrometer, it would be exceedingly difficult to determine the exact scheme of the nuclear reactions producing this radiation. It is the author’s guess that these particles have energies in the range of 1 to 3 Mev. The magnetic-drag tests were conducted at the Pinelandia Biophysical Laboratory on August 22, 2004, and the data are summarized in Table III.